Celebrate Cinco de Mayo with a Rail Jam in the Terrain Park and a Deck Party! Presented by Optimum Performance Cycling, join this early season Hill Climb cycling race from Route 140 to the Wachusett Summit via the summit road. Post-race activities held in the Wachusett Mountain Base Lodge. Details and Registration! In the spirit of National Trails Day, we bring together Worcester County's outdoor community and celebrate ALL trails - hiking trails, bike paths, waterways, climbing routes, and more! 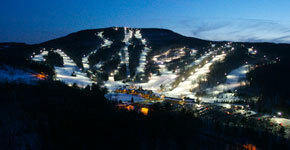 Wachusett Mountain creates the setting for this race where on a clear day features views of Mt. Monadnock in New Hampshire, the Berkshires to the west, and the Boston Skyline to the east. Runners will navigate the trails of Wachusett Mountain, summiting on multiple occasions before hopping on the Midstate Trail to Leominster State Forest home of scenic ridgelines and lakeshore views. The terrain ranges from rolling unpaved fire roads to more technical, single track and multi-use trails. Distances vary from 50 miles, 50K, Marathon, Marathon Relay, Half Marathon, 10K, and 5K.